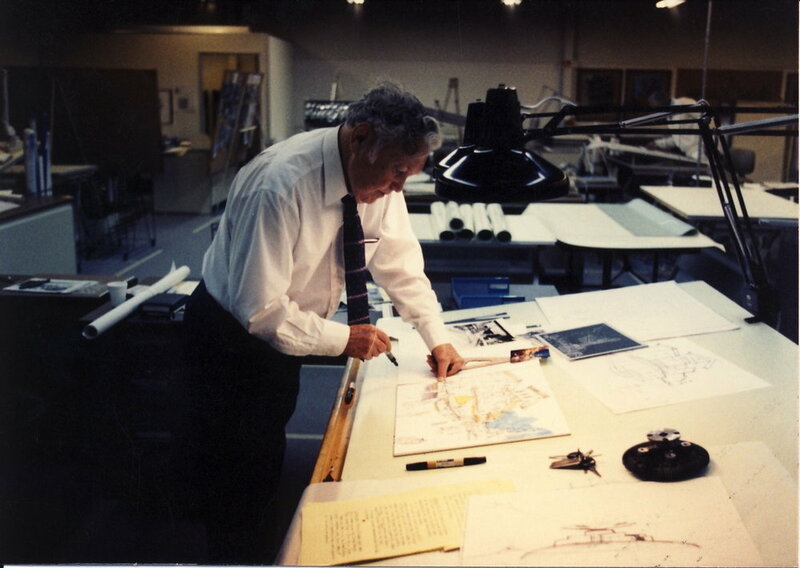 Herbie Ryman 1988, always teaching. 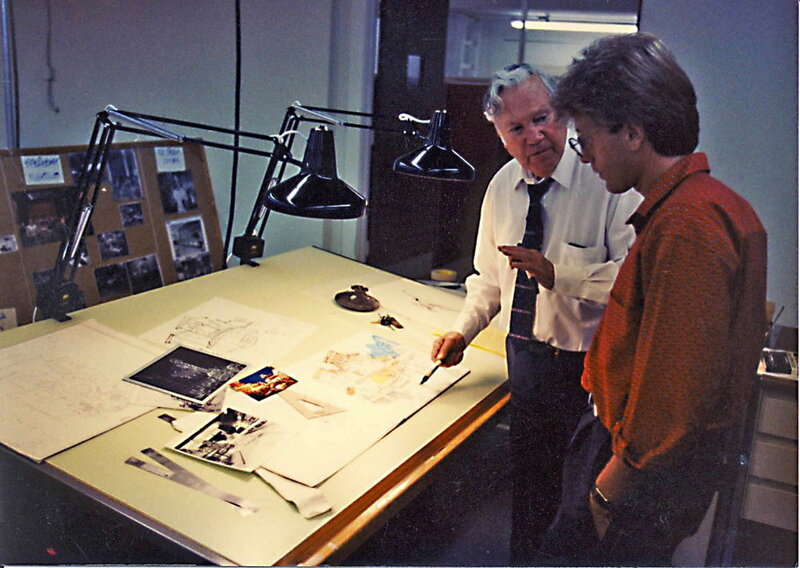 At WED Imagineering I had the honor of working with Disney legend Herb Ryman when heading up our Disneyland Paris Main Street design team. I was looking for talent to help visualize the project and Marty Sklar arranged to bring the now retired Ryman back into the company to help out this young producer. I had met Herb working for industry legend Gary Goddard a few years earlier, and knew of his ability to illustrate an idea like no one else. After all, he had done the original rendering that sold Disneyland, I was hoping he could help sell this new vision of the 1920's themed Main Street for Paris. Sklar warned me that he may not be very productive, but I learned that listening to him and spending time developing a relationship was the key to Herb finding a reason to enjoy the project. And he did, and produced many great things, the best being our friendship. We enjoyed each other very much. He taught me so much that goes beyond the art, but in fact, the "why" of art. Although he turned in some amazing pieces, his health was in decline and our time was cut short. He brought me along to his Thursday lunch group of retired Disney greats, known as "The Dinosaurs." and after his passing, I learned that the best thing he could leave me was not a painting, but his place at the table. Herb always had "business" going on in his work. This Main Street piece has the police and everyone else looking left as if something just happened. Ryman can tell a story almost as good as he paints....this is no exception. When I see this image, I'm reminded of a story. The dark object you see by Herb's hand was the failed fan clutch from his Mercedes. Fascinated by it's shape, I told him I thought it would make a great modern hotel design for the Paris project. (It reminded me of the Tower in the 1929 Film "Metropolis") My sketch is on the board...and he is here telling the photographer the story.. I even photographed it and later developed the design, hoping to later reveal how a "massive German car part landed in the French countryside", Herb and I laughed so much about it...now that's Imagineering! Art lesson. Herb explains how to best leverage both sides of tracing paper with color. Herb put a bit of himself into his work and encouraged me to do the same. "Bad taste costs no more" he'd say and encourage me to go the extra mile, researching the history of a period design, not just copying what has been done, but start with the story and the emotion of why something should be there. Good advice, and as a company, that's exactly what we do today.